Peyote stitch is one of the most popular off-loom beading stitches. It is usually stitched with seed beads and works particularly well with Japanese cylinder beads. The technique you use differs slightly whether you have an even or odd number of columns, which is why you will see even count peyote and odd count peyote noted in the instructions. The even column version, called even count peyote, is the easier of the two and best for beginners. 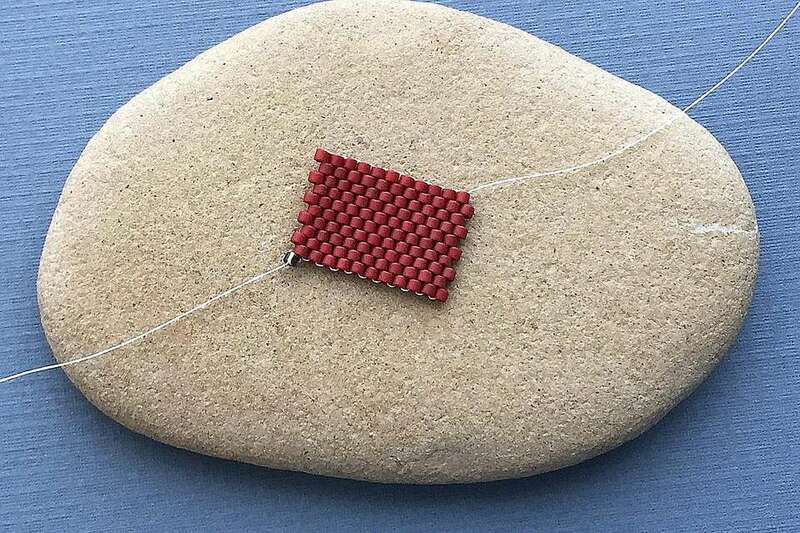 These instructions will show you how to do even count flat peyote stitch using a bead diagram. If you prefer a step by step even count peyote stitch tutorial with pictures is also available. To start a length of flat even count peyote beadwork, condition a length of beading thread if you are using a nylon thread like Nymo. Add a beading needle and pick up a stop bead. Using a stop bead will keep you from having to hold the beads in place or the possibility of your beads sliding off the end of the thread. Position the stop bead at least six inches from the end of the thread. Use your beading needle and thread to pick up as many beads as your design will have vertical columns. In the diagrams above, six beads are used. Slide the beads down to the stop bead. Pick up another bead (bead 7 in the diagrams) and -- while still holding the beads between your fingers -- skip the last bead that you initially picked up, and pass back through the next bead (bead 5 in the diagrams). Pull the thread gently taut to cinch up the tension. Pick up another bead (bead 8), skip a bead in the previous row, and pass back through the next bead (bead 3). Pull the thread taut again. Continue this process until you arrive back at the beginning of the row. If you're having trouble, learn the most common mistakes beginning beaders make. Pick up the first bead for the next row. Reverse direction and pass back through the first protruding bead in the previous row. This is the same as skipping a bead and passing back through the next bead. The protruding bead is sometimes referred to as an up bead. Repeat the process of picking up a bead and stitching into the next up bead to finish the new row. When you reach the end of the row, reverse direction and begin stitching the next row, one bead at a time. Keep stitching until you reach your desired length of beadwork, or until your thread begins to run out; when you have about six inches of working thread remaining, stop and start a new thread. When you complete your beadwork, weave-in and end your thread. Once you have learned even count peyote, even count tubular peyote is equally as easy to learn. Using it, you can make a peyote rope or tube. Even count flat peyote can also be used to make a tube bead or finger rings by making a flat piece of peyote and then stitching the sides together. And after you have mastered even count peyote, you may want to give odd-count peyote a try. It is a similar stitching manner but requires a little extra weaving on the end of every other row.